A friendly little recipe from Elana’s Pantry. I loved these dearly, mostly because I’m a breakfast sandwich fanatic. Give me a fried egg with tomato, avocado, and bacon between two slices of gluten-free bread, and I am one happy chef. Since going paleo, I hadn’t really found a good sub for my occasional breakfast sandwich (which, by default, means I had not had a breakfast sandwich in a year and a half). I was in the mood for a biscuit and stumbled upon this paleo-friendly version. It doesn’t really rise like a regular biscuit and doesn’t have layers or anything. 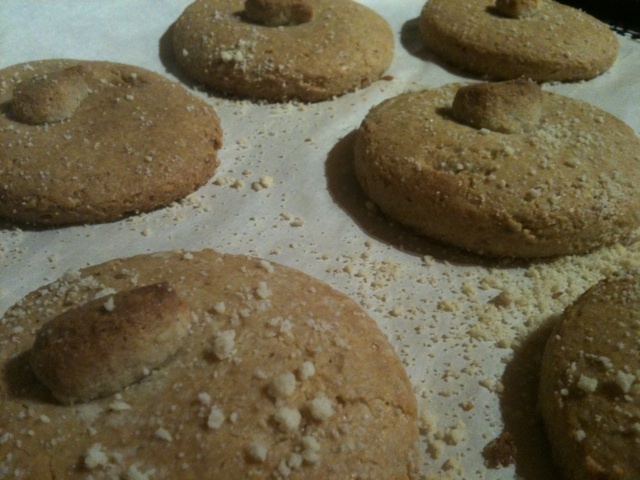 Also, because of the almond flour, has a sweeter taste than traditional biscuits. That being said, this recipe could be used in a savory or sweet context. I did, in fact, make a breakfast sandwich with them (I could slice down the middle without the halves breaking from lack-o-gluten). Note the cute little leftover dough “leaves” on top! note: Elana’s recipe calls for a sweetener like agave or honey, I omitted it. In another bowl, blend together butter and eggs. Stir the dry ingredients into the wet until a dough forms. Roll out dough between parchment paper to 1 ½ inches thick. Cut the dough into biscuits using a mason jar lid. Carefully transfer biscuits to a parchment-lined baking sheet. 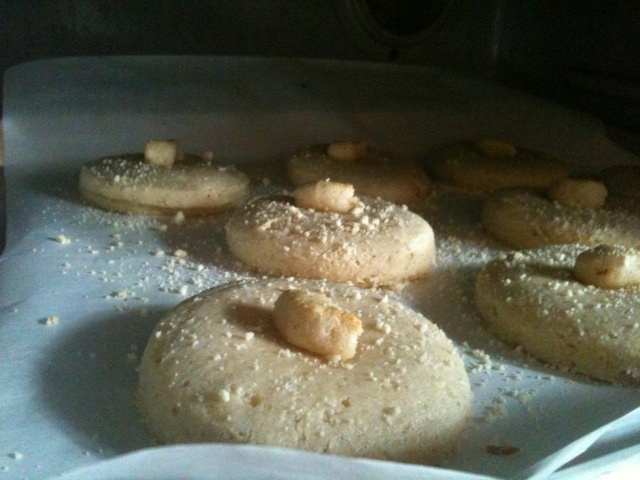 Bake for 15 minutes, until biscuits brown on the edges.